What is worthy of your time? Ask yourself that question. What do you want to spend your time doing for the rest of the semester? What do you want in your portfolio? Pick something you are interested in. That you just like to think about or would/could be reading, looking, learning about/checking out anyway. Pick something you can talk to others about. That you might have easy access to “stakeholders” or the people that care about that issue, idea, activity, organization or business…the owners, founders, employees, customers, vendors, donors…audience. People who care. Pick something that you can help make a difference in or something you just really want to do. Using the cards given right down whatever pops into your head when asked the following questions. The goal is to get a “pile” of words you can sift through, prioritize and say ye or ney to. 1. What is currently getting you stoked? What are you into? 2. What do you like to design/make? 3. What is going on in the world that you care about? 5. What part of the design process do you prefer? 6. What industry would you like to work in? Homework: Begin Project 2. Bring in a Launch and a Refresh idea to share with the class. Make a short slide presentation for each and communicate what it is and why it should change. Review Launch and Refresh presentations. Save a copy on the server. Read Thomas Gad. 4-D Branding: Cracking the Corporate Code of the Networked Economy. 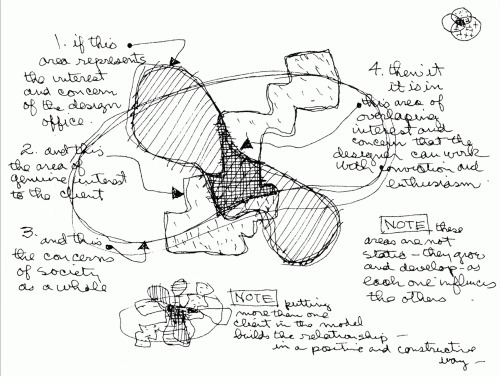 Prentice Hall, 2001| 4D_BRANDING.pdf. Especially the “Discovering New Dimensions” section. Branding Lecture and Set up Weekend/Next Weeks work. 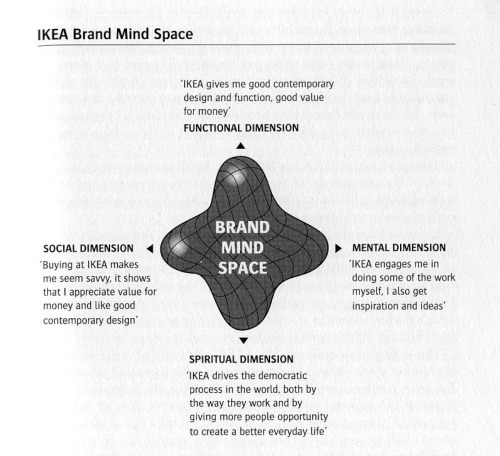 Go over AUDIT & GRAPHING & BRAND MIND SPACE section. Complete the AUDIT & GRAPHING & BRAND MIND SPACE (Steps 1-3) Design your graphs and brand mind space for next class. Print for us to look at and make notes on. Get out. Talk to 5, 10, 20 people about it. Document their stories. Search the inter-nets. Go to the source. See it. Use it. Experience it. Have a “Mini-Blitz" In your room. In your car. At a campsite. Make a meal, invite people to eat, drink and chat about what could be. Be Bold and come up with wild ideas of what the future could look like, should look like. What’s right, wrong or could be better. Report back to us. Visualize what’s going on. Make a model of what is? So we can look at it, talk about it, brainstorm and come up with more wild ideas. No class. Workday and Design Week! What’s happening in your project space? 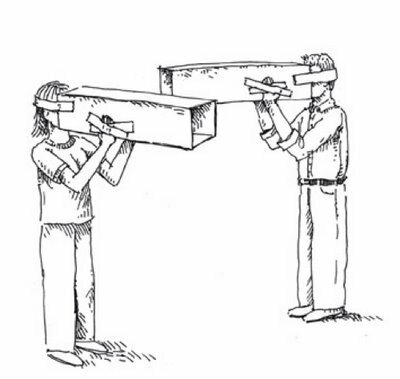 Be ready to work on ways to visualize the situation. We are in the “What is” part of the process. Bring paper, markers, post its, markers stuff. Video Simon Dude Talks about Why? 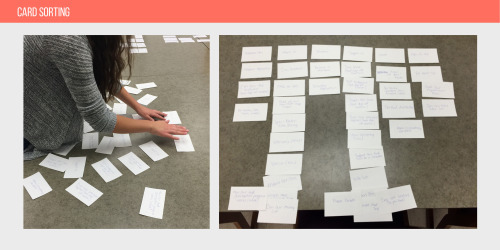 Review: Map out Design Process as a Group and see where these tools, models and methods meet. 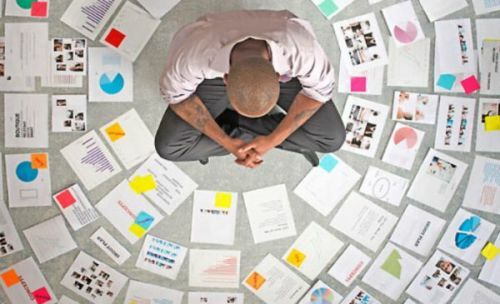 Review: Method Tools, IDEO Method Cards and employ methods you see fit. Scenarios, Personas, Journey Maps and other ways to visually think through what if? Present Research/Audit to date. 10 slides or 10 min. This needs to visual and you need to be able to share with the class. Place a copy on the server for me to grade. Present Research/Audit to date. This needs to visual and you need to be able to share with the class. Place a copy on the server for me to grade. Refinements to Research/Audit. 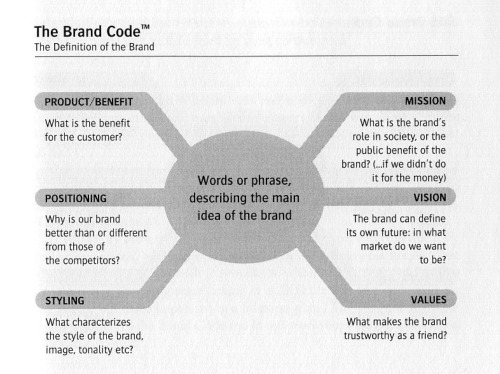 Complete “BRAND CODE” & “BRAND PERSONALITY” diagrams/exercises. Present Big Idea Brand Code and New Brand Mind Space as simple well-designed printouts to pin up so class can read. How will this change you are designing live in the world. How will act? What will its voice be? It’s name can give it legitimacy, it can describe what it is, and what it stands for. Plus it can look great typographically. Are they all played out? Refinements to Brand Code, further connecting of the dots between between strategy, positioning and the problems of the organization. Refinements to Logos (narrow to 2-3 final directions). Worktime. Catch up on what we couldn’t cover last class. 1. Refinements to Brand Code, Image narratives and further connecting of the dots between between strategy, positioning and the problems of the organization. 2. Refinements to Logos (2-3 final directions). For each present in color variations, vertical signature, horizontal signature (other alternate versions as needed). Test how it is working big (4 inches) and small (1 inch). Write an associative wordlist and keyword definitions to get the visual ball rolling. Begin by stating your design goals by writing… So write a Design objectives (or to suggest list…) ex. to suggest __________. 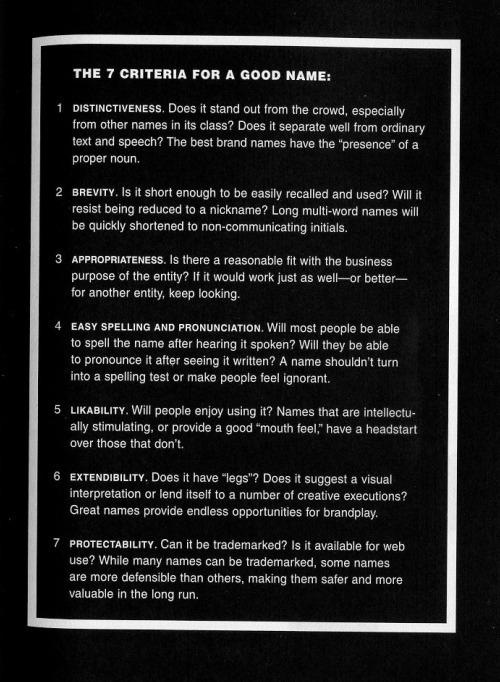 These words could come from your Brand Code “Style” section. Develop color studies. Elements of color should be developed with a clear understanding of how they are to function within the system. This means color is conceptual, aligning itself with the nature of the product or service, and also functional. Develop type studies. Consider carefully the conceptual relationship of the typography as it expresses the meaning of the text. Evaluate the subtle possibilities of character relationship and structural references created by the text and the type. CONSIDER: certain typefaces are designed for certain uses. Think about appropriateness. NUANCE. Develop a portfolio of images which relate to the subject. CAREFULLY consider the communicative qualities of your choice and how that meaning aligns with the reality of the subject. Analyze the ability of the image to work large and small; in color and black and white. STYLE. POV. LENS. DEPTH. MISE-EN-SCENE. What will it look like? How will the name live in the world? and How can we give it a unique and memorable brand identity that will resonant with people? Inclass go over Brand Book Examples and how to present your new brand idea. Design an Brand Book for your Change. How will you set up your project, talk about it, what voice will it have? What visuals will you need to show the change that needs to happen? Create placeholder/quick applications like (buttons, hats, shirts, stickers, flags, banners, etc) to test the identity (kit of parts) out, to play with pacing and create the wireframe of your book. At least 32 pages print and bind use Jayhawk Ink if easier. Use the visual research, diagramming, mapping and modeling we have done to set the context and to communicate the new brand concept you are proposing. Think about voice and how you can leader the reader through this opportunity by providing both overview and opportunity to dig deeper into the design choices and rationale you are putting forward. Use the book to determine what things you want/need to make (applications) to tell the new brand story. Look at Brand Identity Standards and Brand Book Mockup. Atleast 32 pages printed mockup for us to flip through. Think about story, narrative and how you will walk us through the opportunity and solution. How are you engaging your audiences? In class define, re-define or remind yourself and us who cares about this project? who should? and how can you reach them. Today we will brainstorm marketing strategies to get the word out. Rhetorics 101. Make something (online, print, in physical space) that persuades your audience(s) to do something for or with your brand. Refinements to the marketing/promotional piece (BRAND APPLICATION #1). Bring it printed out to share with the class on Tuesday. Additionally design your brand touchpoint wheel. Take this diagram and make it a powerful visual for your brand book. Bring it printed out to share with the class on Tuesday. Review final marketing/promotional piece (BRAND APPLICATION #1) and brand touchpoint graphic. Work on next brand touchpoint/applications (BRAND APPLICATION #2). Bring in three sketches/mockups to pin up for next class. Pin up (BRAND APPLICATION #2) work and review in class. Work on version 2 of the Brand Book. Be able to articulate or even test materials/paper/binding method/laser cutting etc. Brand Book Version 2 Due. Printed and bound for class to flip through. Can be laser prints and clip bound, but be able to articulate or even test materials/paper/binding method/laser cutting etc. A unified Big Idea is usually connected by three messages...What is your brand’s three messages? Write a tagline, headline, saying or quote that expresses each of these three messages. Bring to class...ready to turn into a visual. Pin up (APPLICATION #3) work and review in class. Refinements to Brand Book and finalize (BRAND APPLICATION #3) print this out to share with class next Tuesday. Brand Book Version 3 Due. Brand application #3 Due. Printed and bound for class to flip through. Can be laser prints and clip bound, but be able to articulate or even test materials/paper/binding method/laser cutting etc. Pin up (APPLICATION #4) work and review in class. Refinements to Brand Book and finalize (BRAND APPLICATION #4) print this out to share with class. Brand Book Version 4 Due. Brand application #4 Due. Printed and bound for class to flip through. Can be laser prints and clip bound, but be able to articulate or even test materials/paper/binding method/laser cutting etc. Stop Day. Workday. Production Time. Come in and get feedback if you would like to. Optional Class. Meet for final at 11:30. Final Brand Book and 3-5 brand boards printed and mounted to matte board for display in class. Save brand book as a PDF and boards as a separate PDF and place on server.